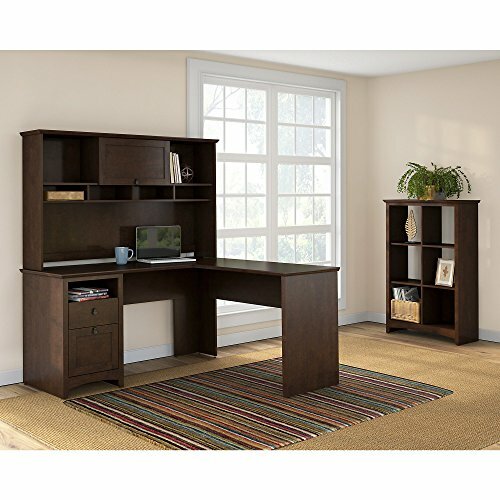 Get style, craftsmanship and a distinctive contemporary look for the home office with the Bush Furniture Buena Vista L Shaped Desk with Hutch and 6 Cube Bookcase in Madison Cherry. Full functionality in a compact footprint works anywhere. Expansive surface offers plenty of room for equipment and papers, letting you spread out comfortably with projects or homework. A box drawer holds supplies while the file drawer accepts letter-size documents. Open storage cubby organizes papers and keeps important work close at hand. The L Shaped Desk features an elegant post-leg design and curved base rails accented by Aged Bronze metal drawer hardware, adding a posh touch to any decor. Hutch has two large open storage areas for books, binders or work manuals. Closed storage in the center comes with a self-sustaining flip-open door and keeps clutter under control. Four cubby shelves offer quick access to work-in-progress. Bookcase has fixed shelves for exceptional structural strength and stability. Six equally divided cube storage areas easily accommodate oversized books, manuals, photos, papers, binders, personal items, mementos and more. Low profile and small footprint provide storage space to spare and let you position where needed most. Closed side panels and open back create a light, airy look. Rugged construction provides long life and functionality. Backed by the Bush Furniture 1 Year Manufacturer's Warranty. See the full collection for coordinating items available. View More In Furniture Sets. If you have any questions about this product by Bush Furniture, contact us by completing and submitting the form below. If you are looking for a specif part number, please include it with your message.